Move along, Windows 8 users, there’s nothing for you to see here. Windows 8 already has its own built-in antivirus solution called Windows Defender, which acts more like MSE than like Windows Defender on older versions of Windows, Microsoft claims. If you’re rocking Windows 7 or earlier, MSE offers more robust protection than Windows Defender, and it's free to boot. But it’s also somewhat limited in scope compared to its freebie competitors. There are just a handful of settings to play with, such as enabling/ disabling real-time protection and setting up file-type exclusions. You can also schedule an automatic scan and (optionally) allocate CPU usage from 10-100 percent in 10 percent increments (50 percent is the default setting). Beyond those controls, micromanagers will quickly grow bored. Once you initiate a scan, you either have to let it complete the run or cancel the process; there’s no pause button. MSE wielded one of the lowest system footprints of all the antivirus solutions we tested. It had virtually no impact on PCMark and only added a few seconds to our 6GB file transfer test. That’s impressive, but lest Microsoft pull a muscle patting itself on the back, MSE’s scan engine ran abysmally slow in our tests. It took over an hour to sweep our hard drive, more than twice as long as the next-slowest contender, and even a subsequent scan took a comparatively lengthy 25 minutes to complete. So the scan engine is slow, but is it methodical? That’s a bit harder to assess. MSE was recently criticized for failing to receive certification from AV-Test.org, though Microsoft contends that 0.0033 percent of MSE users “were impacted by malware samples not detected during the test.” Other labs rate MSE favorably, though in our own tests, MSE was average, blocking most dirty downloads but also letting a few malicious programs write to the registry. MSE passes muster for low-risk users, but there are better AV solutions. 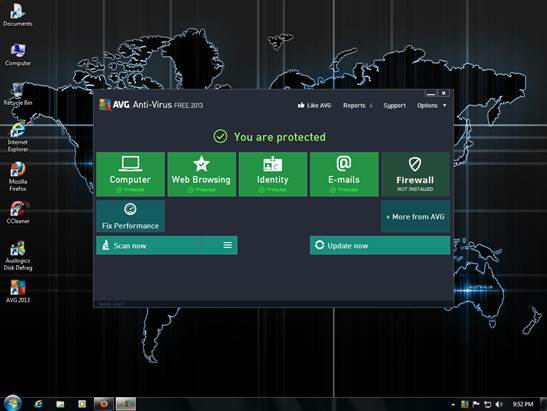 AVG’s interface is a little cluttered, in part because it lists modules that are only part of the paid security suite. You know that long-distance friend of yours who looks drastically different every time you meet up? 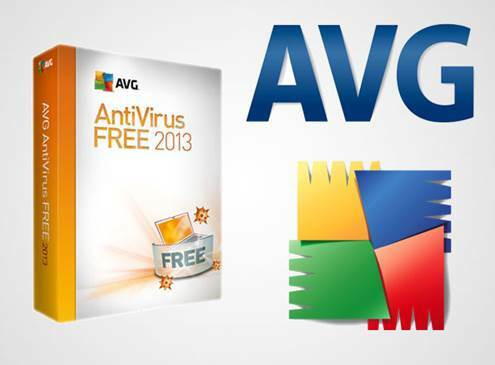 If he were an antivirus program, he’d be AVG, which once again is sporting a new style. This latest version is clearly influenced by Windows 8, though the tiled interface only runs skin-deep. Once you click (or touch] through to the advanced settings, the tiles disappear and a new two-pane window pops up with categories on the left-hand side and checkboxes shoveled to the right. There are plenty of options to keep you busy, and like last year’s release, you can upload custom sounds and attach them to specific events. One thing we found annoying is that a few of the settings are ploys to upsell AVG’s paid security software, and it’s not always clear at first glance. For example, one of the main tiles reads Fix Performance, yet there’s nothing to indicate it’s not included in the free version until after it’s finished analyzing your system for registry errors and other potentially performance-hobbling Cruft. For anyone paranoid about privacy, the Do Not Track feature integrated into AVG’s browser toolbar tattles on websites and advertisers trying to collect data about your online activity. It works with IE, Chrome, and Firefox. There’s also an Identity Alert feature (not to be confused with Identity Protection, which AVG uses to describe behavior-based scanning), but that’s another paid extra. Large file transfers are noticeably slower with AVG installed, though not much else gets bogged down. Scan times were among the fastest, and though we were able to overwhelm AVG’s defenses with dirty downloads, it defused most of the payloads, and was especially adept at blocking browser exploits. Out of the three free AV contenders, Avast offers the best balance of performance and features; AVG is a close second.